All of us use hazardous substances in our homes. To prevent accidental poisoning or exposure, it is important that we recognize these hazards and store these products safely. Check out helpful resources and tips in this issue of You Should Know. > DICKINSON EDITORIAL: ACCESS TO JUSTICE IS A CONSERVATIVE VALUE! Insurance companies are quick to promise safety and protection, but not always quick to deliver benefits. Whether you've been injured in a car wreck or an insurance company has refused your claim, you don't have to accept no for an answer. The insurance rep will not tell you all your rights. It's against their interest to do so. Be sure to contact an attorney who handles injury and insurance coverage claims. Know ALL your rights before you settle. Store toxic products away from kids. A woman in South Jordan, Utah, was recently poisoned when she ordered sweet tea at a restaurant. While making the tea, a restaurant employee accidentally used deep fryer cleaner instead of the sweetener that had similar packaging. All too often we hear about someone who has accidentally poisoned themselves or someone else with a dangerous household chemical. While threats from lead-based paint and asbestos are well publicized, many other silent dangers are present in nearly every home and business in the United States. The good news: some companies and government entities are teaming up to limit the use of these dangerous chemicals in consumer products and are trying to get them off our shelves and out of our homes. Save the Poison Control Center hotline number on your phone: 1-800-222-1222. 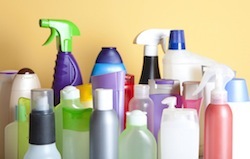 There are 55 poison control centers across the country to answer questions about any product. Fire Chief Joe Bruni explains how and where to store hazardous chemicals to keep them out of the reach of pets and children. View video. Newsey takes an in-depth look at how children are at risk of deadly exposure to liquid detergent pods. View video. See the tragic story of a Utah woman poisoned at a barbeque restaurant by sweet tea contaminated with highly toxic deep fryer cleaner. View Video. And the winner of the 2015 Justice Served award is... Click below to find out, see the survey results and browse AWESOME reader comments.